Triple Alumna Honored for Outstanding Service at SIS Award Ceremony | Alumni News | American University Washington, D.C. Triple alumna Fruzsina Harsanyi gives her honoree remarks. Also pictured: His Excellency Béla Szombati, Hungarian Ambassador; Louis Goodman, SIS Dean; Tamar Gutner, Director of the SIS International Politics Program. 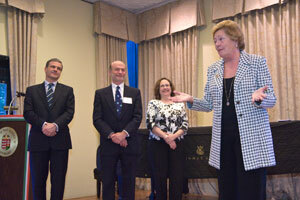 The School of International Service honored Fruzsina Harsanyi, SIS/BA ’64, SIS/MA’67, SPA/PhD ’72, as SIS Alumna of the Year on April 29, 2010 at its 52nd Anniversary celebration hosted by the Hungarian Embassy in Washington, D.C.
“Thank you for letting me flaunt my Hungarian heritage,” Harsanyi told the crowd at the embassy. She made good on her promise to cite her roots after the former Hungarian Ambassador chided her for never mentioning her background at previous speaking engagements. “Paprika courses through my veins,” she said, echoing a line she heard recently from a fellow Hungarian, former N.Y. Governor George Pataki. Harsanyi said she was quite surprised when SIS Dean Lou Goodman told her she had been selected for the award, but also very excited. "I didn’t think that I had done anything so remarkable… other than what I was trained for and what was expected of me." She was a Freshman English major at the University of Pennsylvania when her father came home from a work meeting in D.C. with a brochure from the School of International Service. “The brochure said, ‘Program D: Business Diplomacy’–the classes sounded exotic. World politics and international law sounded much more interesting than dissecting Shakespeare and Chaucer,” she said. She loved SIS so much that she stayed for 11 years straight, long enough to obtain three degrees.“I was a student with tenure,” she says. Her career took off and for 30 years she managed the public affairs for several multinational corporations, including the Continental Group, Combustion Engineering, ABB Inc., and Tyco International. “Hungary gave a bright young student to American University,” then, in turn, “AU gave a great public affairs consultant and teacher to the world based on the raw materials that Hungary gave,” he said. This fall, Harsanyi will return to AU to teach a class on International Global Public Affairs at SIS. She will also teach at Georgetown University and the Australian Center for Public Affairs.